Despite the MSM7201a core, the UI is definitely faster than any factory ROM we've used before on any Android device. A good test of this is to quickly swipe open the app drawer -- the action's smooth on the CLIQ, whereas most Magic ROMs would stutter. The screen is glass capacitive, and it feels that way. There's no "give" like you've got on a G1 or Magic, for example. Expanding on the glass screen, the device feels absolutely fantastic overall. Through Motorola's thick and thin, you've got to admit that the company has a reputation for building ridiculously rock-solid phones, and we're pleased to say that the trend is continuing with the CLIQ. Pictures don't do it justice -- the white model looks particularly cheap at a glance -- but in the hand, it feels like it's fashioned from a solid block of metal. The camera button has a focus detent, which makes it a heck of a lot easier to properly harness the power of your 5 megapixel autofocus optics. The jury's still out on photo quality, but it seems promising and focusing is relatively quick (though our disappointment in QVGA 24fps video still runs pretty deep). This probably blew Google's mind, but MOTOBLUR has five home screen panels along with a small indicator similar to the iPhone's to show you which one you're currently on. Who knew that someone might want more than three? The keyboard feels great. Truly stellar, actually -- and we don't think there's much room for complaints about layout, unless you're really into the dedicated horizontal number row. We'll have more thoughts this evening once we've spent more quality time... you know, "clicking" with the CLIQ. Sorry. 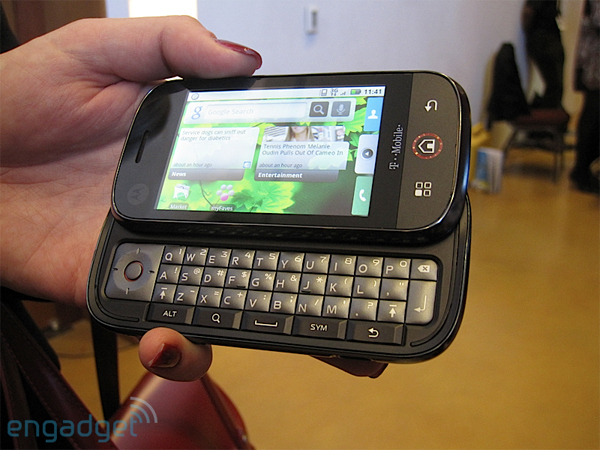 Motorola CLIQ: first hands-on impressions originally appeared on Engadget Mobile on Thu, 10 Sep 2009 17:20:00 EST. Please see our terms for use of feeds.